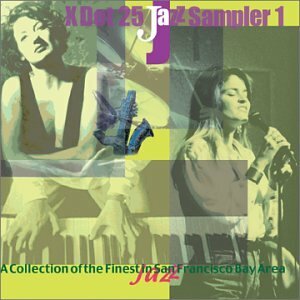 The best of jazz from X DOT 25's jazz label. Enjoy this collection of compositions from X DOT 25 Music's World Class Jazz Musicians. Instrumentation: Tenor & Soprano & Alto Saxophones, Persian Tuned Piano, Bass Clarinet, Alto Flute, Drums, Vocals, Organ, Acoustic and Electric Bass, Samples, Dub Processing, Percussion, Turntable, Trumpet, Bass, Guitar & Effects, Tombak. With this extraordinary anthology in hand, you are standing on the proverbial tip of the iceberg, for beyond the twelve tracks gathered here looms a massive music scene in the San Francisco Bay Area. Perhaps iceberg is too cool an image; what's happening in this community is red hot. But these progressive sounds most definitely form a tip -- the advance guard of what Ornette Coleman once prophetically called "The Shape of Jazz to Come. "In the strictly commercial terms of record sales, San Francisco is the second largest market in the United States. In terms of creativity, however, the Bay Area plays second fiddle to no one. You can add guitar, saxophone, keyboards, trumpet, bass, drums, percussion, and vocals to that list, as well, judging by the talents assembled between the bookends of Dan Zinn's intriguing opening contribution and Hafez Modirzadeh's evocative conclusion. Awareness of Northern California's musical ferment has grown in recent years with the high profile of such players as guitarist Charlie Hunter, saxophonist/composer Peter Apfelbaum, and the three-guitar band T.J. Kirk. X Dot producers, and co-compiler Doré Stein have turned their sharply tuned ears to the broader context from which those young stars have risen. From a teeming cauldron of acid jazz, free improvisation, Latin and world music, and fusion that defies the common connotations of the term, they have plucked an exemplary batch of equally gifted contemporary innovators, whether signified by the name of the leader, such as Andre Bush, or a provocative group moniker like 3 Bean Salad. Celebrated guest stars pepper this recording: bassist Eddie Gomez and drummer Al Foster in guitarist Paul Mousavi's rhythm section, and saxophonist Steve Coleman blowing with pianist Vijay Iyer. But take note, as well, of such names in the credits as Paul Hanson (revolutionizing the jazz bassoon in other contexts), John Yi (a member of the avant-garde trio Fatty Boom Boom), John R. Burr (a ubiquitous keyboard master), brothers Mark and Paul Van Wageningen (whose rhythm section skills are in constant demand), and Will Bernard (guitarist with T.J. Kirk, Jai Uttal and Peter Apfelbaum now stepping out with his own quartet). As evidence of the scene's sense of community, witness the varied and more than coincidental cross-collaborations on this recording -- Hafez Modirzadeh joining Ann Dyer & No Good Time Fairies, Dann Zinn switching to alto on Wally Schalle's "Scratch Shot," Dred Scott stretching the keyboard sounds for President's Breakfast, Paul Van Wageningen drumming with both Zinn and Claudia Villela. And it as a representation of this fertile grassroots community, in all its diversity and experimental power, that X Dot's jazz sampler promotes the interests of exciting original music everywhere. Recorded at Mesa Recording Studios, Sebastopol, California. Engineered by Hans Christian Reumschüssel, assisted by Kenny Evans. Recorded at Sound On Sound Studios, N.Y.C. Engineered by James Farber. Mixed by Howard Johnston at Different Fur Studios, San Francisco, California. Mastered by George Horn at Fantasy Studios, Berkeley, California. Carla & Christina Villela, additional voices. Recorded by Devon Rietveld at The Plant Recording Studios, Sausalito, California . Mixed by Devon Rietveld and Claudia Villela at The Plant Studios. Recorded at Pyramid Studios, San Francisco, California. P 1995 Jazz Dog Music. Steve Coleman (courtesy of RCA Records), alto saxophone. Recorded, mixed and mastered by Cookie Marenco at OTR Studios, Belmont, California. Arranged by Ann Dyer and No Good Time Fairies. Recorded at Live Oak Studio Berkeley, California. Mixed at Different Fur, San Francisco, California. Tom Bockhold, bass; Selector G, scratch. Recorded by Scotty Smith at TRS, Sunnyvale, California. Mixed by Wally Schnalle, Scotty Smith and Cal Ball at TRS, Sunnyvale, California. Pre-mastered at Session Kat Productions by Tim The Kat. Mastered at Fantasy Studios, Berkeley, California by George Horn. Recorded by Mark Schleunes at CrowMagnon Music, Oakland, California. Mixed by Mark Schleunes and 3 Bean Salad at CrowMagnon Music, Oakland, California. Blane Finell, trumpet. Produced by Bill Langton. Engineered by Phred Cirillo, Hage Van Dijk, and Ed Herrmann. Mixed by Click Dark, Phred Cirillo, Hage Van Dijk, and Ed Herrmann. Mastered by Paul Stubblbine at Rocket Lab. Digital editing by Hage Van Dijk and Click Dark. Engineered and mixed by Cookie Marenco and Generosa Litton. Mastered by Victor Owens at Digisonic, Berkeley, California.